All Gourami species are tropical fish belonging to the Labyrinth family, and they live exclusively in fresh water. The Labyrinth family include several other notable members, such as the Climbing Perch and the Betta / Fighting Fish. What all Labyrinth species have in common is the presence of labyrinth-shaped breathing organs connected to each gill chamber. This adaptation makes Labyrinth fish, such as the Gouramis, very suitable for a life in low oxygen waters, since the organs make it possible for the fish to absorb oxygen directly from the air. All Gourami species originate from Africa and Asia, and there are approximately 12 different Gourami species frequently kept in aquariums today. Many of the Gourami species can be found in several different colour variations. The Gourami species named Osphronemus goramy is considered the “true Gourami”. It originates from Indonesia, but is today found wild in Chinese and South Asian waters as well. It has been deliberately introduced by man and is considered a delicates. Osphronemus goramy is sometimes called Giant Gourami, since it grows very fast and can exceed 60 centimetres / 2 feet in length. If you wish to keep an Osphronemus goramy you must therefore provide it with a very large aquarium, and also keep in mind that it can live for 25 years or longer in captivity. It comes as no surprise that other Gourami species than the “True Gourami” are more popular as house pets today. 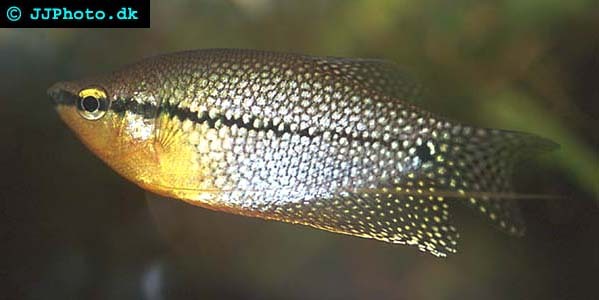 Helostoma temmincki, the Kissing Gourami, is the most popular Gourami species among aquarists. It seldom grows bigger than 25 centimetres / 10 inches. The so called Talking Gourami, Trichopsis vittatus, is an even better choice if you have a smaller aquarium since it will stay around 5 centimetres / 2 inches. The Talking Gourami is also called the Croaking Gourami, since the male fish produces a croaking sound when it surfaces during the night to breed oxygen from the air. If you want a somewhat larger Gourami in your aquarium, the Moonlight Gourami (Trichogaster microlepis ) is a good option. It is comparatively easy to care for and typically reaches a length of 15 centimetres / 6 inches. The Moonlight Gourami features threadlike ventral fins and derives its name from its silvery-blue colouration. A majority of the Gourami species appreciates the same type of living condition, since there do exists a few differences between the species regarding preferred water temperature, pH-value, diet requirements etcetera it is always recommended to do some reading regarding your particular Gourami species as well. Generally speaking, Gouramis will do well in water temperatures around 24 – 26 degrees C (74 – 79 degrees F). When it comes to pH-values, neutral or slightly acidic water will be best for the Gourami. Gouramis also prefer to be kept in relatively soft water. The aquarium where your keep your Gourami should be well planted, preferably with sturdy plants such as Java Fern, Vallisneria or Cryptocoryne plants. Cover the bottom of the aquarium with a neutrally coloured fine or medium sized substrate. Gouramis must be kept on a varied to get all necessary nutrients. They are usually happy eaters in the aquarium and will accept most food types. They are quite sturdy and will often survive even on a less than optimal diet, but such a diet will make them more prone to illness and they will not look their best. Dry or frozen prepared foods are a good base that can be supplemented with live foods. Fresh vegetables are also a good addition, e.g. lettuce and peas. Gouramis love Brine Shrimp and all kinds of worms (Glass worms, Black worms etc). The Gourami is a popular fish in community aquariums since it is relatively peaceful and gets along fine with most other fish. The best companions for a Gourami are other peaceful species of approximately the same size as the Gourami. 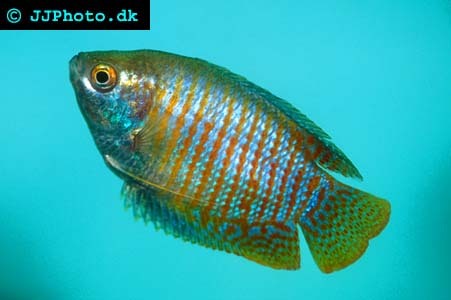 Other Labyrinth and dwarf cichlids are frequently kept with Gourami. You can also keep several Gouramis in the same aquarium, as long as the aquarium is big enough for them to claim their own territories. Natural barriers in the aquarium, such as plants, will reduce the amount of fighting between Gouramis since they can stay out of each others sight.